I wish I could say a lot has changed for the better during the past decade, but a quick click on "Google News" will swiftly dispel that notion. Even so, if life is about nothing else, it's about hope...sometimes it's all that keeps me going! Enjoy your spin around my updated electronic billboard. Questions? Email me. Oh, yeah....did I mention that my CIA memoir is finally out?For more about the book, visit my blog. "Everyone concerned with the importance of thoughtfully calibrating the proper balance between the people’s right to know, as sovereigns in our system of government, and what information bearing upon national security must be controlled must read this book and take it to heart, mind, and soul." 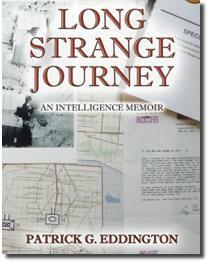 "Long Strange Journey gives us a peek into the bowels of the intelligence community, and it isn't a pretty picture. CIA analyst Pat Eddington took on a hidebound intelligence bureaucracy more interested in pleasing political masters than fulfilling its obligation to protecting the nation and those we put in harm's way. Part spy thriller, part scandal, part love story, this book will make you hope there are more like him fighting for truth and justice behind the CIA's veil of secrecy."